Publisher Book Slam - The hottest publishers each have 15 minutes to pitch you the hottest books. Emceed by Bill. Library Confessions - Tell your darkest secret to Gene for later podcast. Names will be changed to protect the not-so-innocent. 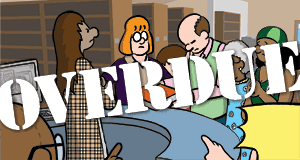 Unshelved Live - Bill and Gene will write and draw an Unshelved comic strip with your help! Suggest the topic, come up with the punchlines, and lay it out. Unshelved Store - Jana will have more Unshelved books and merchandise than ever before, including our new book, Frequently Asked Questions. Finally, Gene and I will be debuting our new talk Surviving the Public Saturday at 11am. Learn the Unshelved way to deal with the worst people on earth: customers. If you're not already registered the best place to do it is through our Unshelved@BEA page, because you'll qualify to win cool prizes from Unshelved and BEA, including an appearance in Unshelved. We've still got three more drawings, so sign up today for the most chances to win!